• Go a step beyond Nyerak and visit Lingshed. The tour operator reserves the right to cancel or alter the itinerary of the trek to ensure maximum safety for travellers as well as staff. | If you cannot join the trek after the medical test, the operator is not responsible for any activities, injury, illness, or additional expenses. Make your way over the Zanskar towards the village of Lingshed, the closest hint of civilization for miles on every side. While most trekkers over the Chadar return from Nyerak, you'll proceed deeper to spend a night at Lingshed. You'll have spectacular views of the rocky, mountain terrain, en route to Lingshed. Overnight in tents at Lingshed. Begin the return trek by retracing your steps to Nyerak Pulu. Even though you've trekked over this route yesterday, you'll get a slightly different experience of the Chadar since the frozen ice often breaks, melts and reforms over night, leading to changes in the terrain. Overnight in tents at Nyerak Pulu. 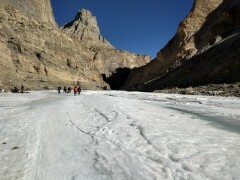 Pack up and move to Tibb Cave, a series of ancient caves that today provide refuge to travellers over the frozen Zanskar. Local villagers wearing traditional woollen robes are often seen hauling goods and traversing the route to Tibb Cave. Overnight in tents at Tibb Cave. Make you way to Gyalpo, named after mythical spirits in the Tibetan culture. En route, you'll trek past the Shingra Koma campsite. 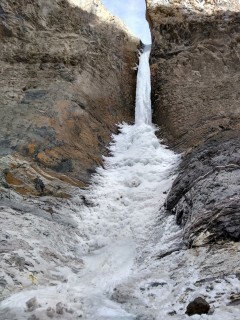 The walk to Gyalpo is peppered with views of frozen waterfalls, towering mountains and icy landscapes. Overnight in tents at Gyalpo. Travel from Leh to Tilat Do in shared, private vehicles, most probably a Bolero, Sumo, Jeep or similar vehicle. Trek from Tilat Do to Shingra Koma. You'll be accommodated in tents on twin-sharing basis. Today's meal package includes lunch and dinner only. You may want to have breakfast at your own expense at the hotel in Leh. Overnight in tents at Lingshed. Trek from Nyerak Pulu to Lingshed. You'll be accommodated in tents on twin-sharing basis. Today's meal package includes breakfast, lunch and dinner. Throughout the entire trek, you'll be accompanied by an experienced trek leader and a support staff of helpers, cooks and porters. Trek from Lingshed to Nyerak Pulu. You'll be accommodated in tents on twin-sharing basis. Your dome tents will be equipped with sleeping bags and mattresses. The campsite is also equipped with common kitchen/dining tent and washroom tent. Today's meal package includes breakfast, lunch and dinner. 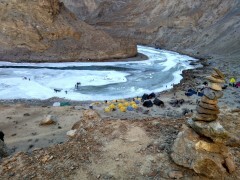 Overnight in tents at Gyalpo. Trek from Tibb Cave to Gyalpo. You'll be accommodated in tents on twin-sharing basis. Today's meal package includes breakfast, lunch and dinner. Trek from Gyalpo to Tilat Do. Travel from Tilat Do to Tilat Do in shared, private vehicles, most probably a Bolero, Sumo, Jeep or similar vehicle. Today's meal package includes breakfast, lunch only. You can visit any of the restaurants in Leh to have additional meals at your own expense.